Do I have to be trained to do Shorewatch? Yes. In order to compare observations between shore-based sites, volunteers should all be trained to the same level and conduct observations in the same way. We will train you to recognise common local species and how to collect sightings and environment data. Shorewatch runs training days throughout the spring and summer, contact shorewatch@WDC.org for details. Do I record any data if I don’t see cetaceans during my Shorewatch? Yes. We need you to record when cetaceans are present and also when they are absent. Negative data (when cetaceans are not present) is really important to the project as it allows us to say something about how often cetaceans are seen; making the positive data (when cetaceans are seen) more valuable. For example, you might see bottlenose dolphins 30 times throughout the year. It is clear that bottlenose dolphins use this area but we have no idea how many times they may be around that we don’t see them. But if we have done 90 watches and have seen dolphins 30 times it means that there is a 1 in 3 chance of seeing dolphins and that they use the area regularly. Compare this to if we had done 300 watches, we would have a 1 in 10 chance of seeing dolphins and that they use the area less regularly. How frequently can I watch? Shorewatches should be carried out no more than once per hour. Within these limits, extra watches can be conducted as and when you have the time. The decision to carry out a watch must not be made as a result of you or someone else seeing cetaceans in the area. Shorewatches should be pre-planned to some extent. Can I use my own binoculars? No. You will need to use the Shorewatch-issued binoculars to keep the watching effort consistent between sites. The only exception is if you already have a pair of the same specification or would like to purchase a pair. Shorewatch uses Opticron Marine 7 x 50 binoculars with Internal Compass and Reticule Distance Scale. I have been told there are dolphins in the area. I have been told there are dolphins in the area. Can I do a Shorewatch? You cannot do a Shorewatch simply because you have been told that there are dolphins in the area, this would bias the data to positive sightings. If you were already planning to do a Shorewatch then continue with your Shorewatch as planned. However, any opportunistic or casual sightings are still useful and can be recorded on the Cetacean Sighting Data Sheet as ‘off effort’. What are GMT and BST? We ask you to record whether your Shorewatch has been carried out in is in GMT (Greenwich Mean Time) or BST (British Summer Time). GMT is World Time and the basis of every world time zone which sets the time of day and is at the centre of the time zone map. GMT sets current time or official time around the globe. Most time changes are measured by GMT. The standard time in the UK is GMT. In the UK, Summer Time (BST) clocks move forward 1 hour. BST begins the last Sunday in March and ends the last Sunday in October. How do I use the interval timer or reset it if it is not set up correctly? The interval timer should be pre-programmed to beep every minute for 10 minutes to help time your watch. To turn the timer ON: hold down the NEXT button for a few seconds then release. When you are ready to begin your watch, push START to begin timing. The counter will count down from 01:00 (1 minute). When it reaches zero, an alarm will sound. This process will be repeated ten times. After ten minutes, the timer will sound a longer intermittent alarm, indicating that Shorewatch is over. If you find that the timer is not set correctly, please reset it. There are full instructions on how to reset the interval timer in the Shorewatch Protocol Document. If, during the binocular scan, I finish one quadrant before I hear the timer beep, do I continue to the next quadrant? No. If you finish scanning a quadrant before the timer sounds, repeat your scan of this area until you hear the beep and only then should you move onto the next quadrant. If the timer sounds before you have finished a quadrant, move onto the next quadrant immediately to maintain the even effort throughout the area and try to adjust your scanning pace for the next section. What do I do if I am disturbed in the middle of my Shorewatch? Shorewatch is 10 minutes of concentrated effort. If a member of the public starts speaking to you during your Shorewatch, explain that you need to keep your eyes on the sea for 10 minutes and invite them to help you watch. If you take your eyes off the watch area for any length of time, the Shorewatch will not be valid. Please indicate that the watch was not completed on the data sheet. If environmental conditions change dramatically during your watch or there is some other disturbance you may also need to stop your Shorewatch and indicate this on the data sheet. Do I have to record my sighting on the back of the data sheet if I have put it in the notes on the front? Yes. Any time a cetacean is sighted on Shorewatch it is important that we have all the details of the sighting recorded on the back of the data sheet. What do I do if I see two distinct groups of cetaceans on a Shorewatch? Two distinct groups of cetaceans should be recorded as two separate sightings on different lines of the Cetacean Sighting Data Sheet. This is also the case if two different species are seen during a Shorewatch. What if I see the same group of animals during a second Shorewatch? If you have not left the area between Shorewatches and are 100% sure this is the same group of animals then you do not need to record details of this sighting again. Record the cetaceans were present during the second Shorewatch on the front of the data sheet. On the back of the data sheet edit your sighting end time to make it clear that your sighting lasted for the time between your two watches. Do I count boats that I can see with my eyes only? You look for the boats with your naked eye but feel free to use your binoculars to identify them. The idea is that the noise from larger boats (like tankers) travels further so it makes sense to record them at greater distances where you might not see, for example, a small motor with the naked eye. We plan to look at how our boat data can be used and determine whether we need to start taking distances and locations in a more formal manner in the future.What do I do if I spot cetaceans? Do I stop the watch and then restart after I have identified the cetacean? Do I carry on with the watch from the point I stopped at or do I jump to the next quarter? The most important thing is to note down the details of the sighting that you have made. Take a bearing, reticule and distance estimate and watch for long enough that you are fairly confident about species-ID, number of animals and behaviour. If this sighting happened early in the watch, you may have time to continue your Shorewatch within the 10-minute watch period. Prioritise quadrants which have not yet had any watch effort (if you saw the animals in the first scan of quadrant 2, you might want to scan quadrants 3 and 4 in the remaining minutes). It is always good to use your naked eyes at the end of a watch since you can cover the entire area so if you only have one minute left, this might be your best choice. NOTE: A Shorewatch should not last longer than 10 minutes from start to finish even if you spent part of that time detailing a sighting. What do I do if someone I am with spots a cetacean in a different quarter to the one I am on? How do I tell if I have two separate groups or one widely spread group? This is a tricky one. Different species can always be considered different groups and please note in the comments if they are mixing together. Within a sighting of a single dolphin species, however, particularly if they are near the coast and feeding, it is more likely to see a single group which has spread out over the area. This is even more likely to be true if they are exhibiting the same behaviour. Reasons to consider a group to be two (or more) groups coming together can be seen in the following example: an initial group is exhibiting ‘stay’ behaviour in your field of view and has been there from the beginning of your watch. In minute 7, another group is seen in the distance and travelling toward the group in front of you. In this example, the groups are exhibiting different behaviours (initially); seen independently at distance from each other; sighted at different times; and you have clear counts of each group so that you know the first group has not diminished when you see the second group. How do I count reticules if there is haar covering the horizon? The only answer is to do your best! You can scan around the horizon to see if there is a place clear of haar to give you a reference. Make a note of any issues like this in the comments. As always, please remember to give a distance estimate as well. If you feel that it is impossible to gauge the reticules, we can still use the distance estimate to mark your sighting on a map. If the cetacean travels before I have an accurate bearing what do I do? Can I record the bearing once I’ve identified the cetacean? It is best to record the bearing where you first saw the cetacean and then note the direction of travel in the sighting comments. This is not an exact science, however, and if you get the bearing at a later point, that still marks the sighting within your Shorewatch site. Please still put the notes about movement in the comments. Also, remember that you might be able to note that the initial sighting was ‘over that fence post’ and then come back to take a bearing after you have done your ID. Do I need a bearing and reticule count for a casual sighting? Wherever possible, yes please! 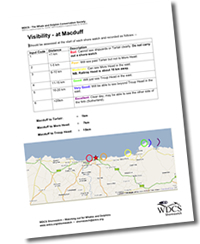 This would help us to mark the sighting on a map should the need arise. Does Sea State and Visibility need to be recorded as a whole number? Yes. You need to make the decision as to what Sea State and Visibility you think it is. Both need to be recorded as a whole, discrete number e.g. 2 or 3. Sea States and Visibilities that are not whole numbers e.g. 2-3, 3.5 or 1 ½ will render the data unusable. Use the laminated guides in the clip box to help you. How should I record other wildlife? If you spot any wildlife which are not cetaceans e.g. seals, basking sharks and birds they can be recorded in the notes section on the front of the data sheet. When recording boats, how do I tell the difference between a small motor and a large motor? A small motor is anything from a jet ski to a small fishing boat. With most small fishing boats the wheel house is at the front whereas with large boats the wheel house is towards the back. When do I need to record feeding birds? Record only rafts of feeding birds i.e. when a large group of birds are circling and diving in a particular area. This indicates that there is some activity happening below the surface of the water. Does distance (reticules) also have to be recorded as a whole number? No. As the separation from one reticule to the next may cover a large part of your survey area you are welcome to use simple fractions such as 2 ½ or 3 ¾ when recording the distance using the reticule lines. The reticule lines on my binoculars are different sizes – are some halves? No. Even though some of the lines are smaller they are all equal to one reticule. How do I know when other Shorewatchers are visiting the site? Each site is co-ordinated differently. Please contact us for more details. Do I need to return the data sheets? Shorewatch data is shared with national biodiversity recording schemes so completed data sheets should ideally be returned monthly. The person responsible for returning sheets will differ between watching sites. Contact us for further details about your site co-ordinator. 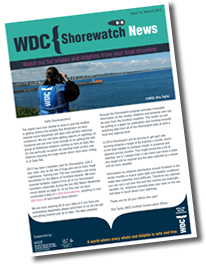 If you have any questions about Shorewatch which are not answered above please contact WDC Conservation Officer on 01343 820339 or shorewatch@whales.org.